When you and your client “get out of sorts with one another”, it is your responsibility (IT) to resolve the issue. It’s up to you to improve the relationship, , , it simply won’t happen the other way. 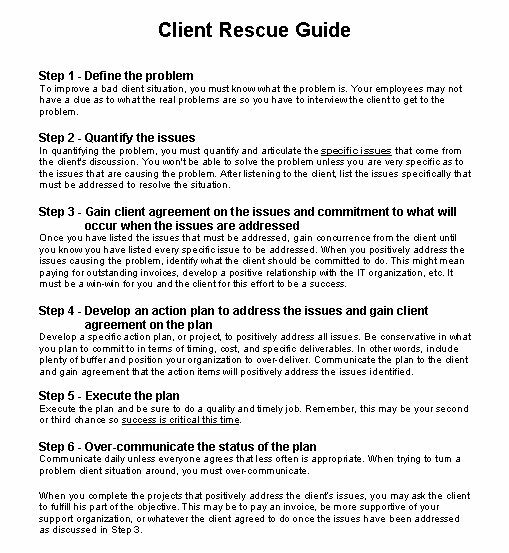 A simple process I go through when dealing with a problem client is included in my Client Rescue Guide. It worked for me many times and will for you. A problem client is actually an opportunity in disguise. Their bad behavior and harsh words are simply frustrations seeking their way out of the client. It’s not personal although sometimes it may feel like it. To rescue a client from the doldrums does not require a technical or complicated process, , , it is actually pretty simple when you get down to it. CLICK HERE to download my Client Rescue Guide.